Shankill Baptist is one of the oldest Baptist churches in Belfast, being established in 1896. Back then, it was a rural church. Today, the church exists in the middle of the bustling streets of Belfast city. There have been many changes in the area, but the church has remained faithful - continuing to preach the gospel and develop Christian followers among local people. Our team arrived on Sunday, 22 October, having been invited by the Church to help with their work. 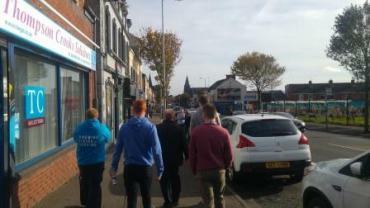 As well as holding a couple of special events, such as a table quiz and ladies’ fellowship meeting, we also took part in various tasks such as taking the Sunday services, schools and youth work, door-to-door work and street evangelism, all of which are part of the church’s regular activities. The Church has many faithful members, but only a small evangelism team working on a weekly basis - some of their older members are unable to help due to ill-health. Evangelism week was a great opportunity for us to offer our support and encourage the Church to continue to work in an area that needs Christ.Please pray for the Church, as they seek to faithfully serve God, and for Neal Gordon (Pastor), as he seeks to help the Church grow by means of the Gospel and the Word.